Dimensions: 69.8mm x 100.1mm x 7mm. Weight 90.03g. Interface: SATA Rev. 3.0 (6Gb/s) with backwards compatibility to SATA Rev. 2.0. Controller: SandForce® SF-2281. Compressible Data Transfer (ATTO) All capacities: 500MB/s Read and 500MB/s Write. Incompressible Data Transfer (AS-SSD and CrystalDiskMark): 420MB/s Read and 120MB/s Write. IOMETER maximum 4k read/write:up to 84,000 up to 52,000 IOPS / Random 4k Read/Write: up to 11,500/ up to 52,000 IOPS . PCMARK® Vantage HDD Suite Score : 60,000. PCMARK® 8 Storage Bandwidth Score: 140 MB/s. Total Bytes Written (TBW)4: 354TB 2.75 DWPD5. Power Consumption: 0.31 W Idle / 0.35 W Avg / 1.65 W (MAX) Read / 2.76 W (MAX) Write. Storage temperature: -40°C~85°C / Operating temperature: 0°C~70°C. Disclaimer : Kingston SHFS37A 240GB HYPERX FURY SSD Internal hard Drive SATA3 2.5 7mm price in Pakistan is updated on daily basis and rate/price for Kingston SHFS37A 240GB HYPERX FURY SSD Internal hard Drive SATA3 2.5 7mm is valid for all cities of Pakistan included Islamabad, Rawalpindi, Lahore, Karachi, Faisalabad, Peshawar, Sialkot, Quetta etc. 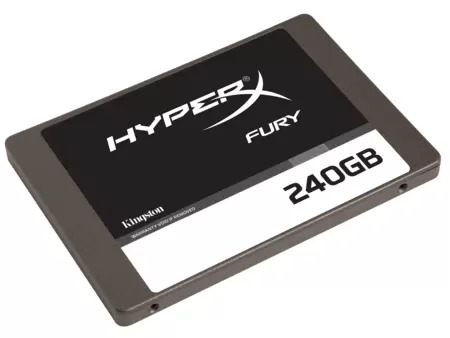 Kingston SHFS37A 240GB HYPERX FURY SSD Internal hard Drive SATA3 2.5 7mm price depends on many factors thats include the price of dollors, manufacturar price and import cost and duties etc. Our team entered specs from diffrent resources and not responsible for any typo error in specs for Kingston SHFS37A 240GB HYPERX FURY SSD Internal hard Drive SATA3 2.5 7mm, please report any such error in bug report panel for Kingston SHFS37A 240GB HYPERX FURY SSD Internal hard Drive SATA3 2.5 7mm. Kingston SHFS37A 240GB HYPERX FURY SSD Internal hard Drive SATA3 2.5 7mm price in Pakistan.